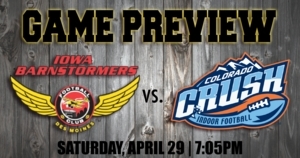 DES MOINES – The Iowa Barnstormers (6-2) look for its fifth consecutive win as they take on the Colorado Crush (2-6) on Saturday, April 29, 2017. Kickoff is set for 7:05 p.m. CDT at the Wells Fargo Arena. Fans can tune in live on YouTube. Last week, the Barnstormers won a tough road game defeating the Cedar Rapids Titans 31-25. Receiver Brady Roland caught three touchdowns passes in the first half, while quarterback Travis Partridge scored four total touchdowns with the biggest one coming on the ground giving Iowa a 31-19 lead midway through the fourth quarter. Defensively, last week’s defensive player of the week DaeJohn Love recorded 11 tackles and recovered a fumble which set up a scoring opportunity for the Barnstormers. Late in the game, the defense sealed the victory for Iowa when they stuffed the Titans at the goal line three times at their own two yard line. Last week, the Colorado Crush defeated the Wichita Falls Nighthawks at home 77-73. Crush quarterback Liam Nadler threw for 273 yards and scored nine total touchdowns in the game with seven of those coming through the air. Receiver Kyle Kaiser hauled in four touchdowns and racked up 100 yards receiving. Defensively, the Crush picked off the Nighthawks twice in the game. Defensive back Daniel Lindsey had nine total tackles and an interception, while Kwame Bell had eight total tackles and a forced fumble. The Barnstormers will also be hosting a Food Drive at the game in partnership with the Des Moines Area Religious Council. Fans who bring two non-perishable food items to donate at the game will receive a “buy one get one free” ticket voucher to an upcoming Barnstormers game. Collections will be taken at all entrances of Wells Fargo Arena starting at 6:00 p.m. CDT. The Iowa Barnstormers will also be hosting their Annual First Responders Night this Saturday, April 29. Tickets are available now for just $15 with a portion of the proceeds benefitting the Family Funds at the Des Moines Police Officers Credit Union. To purchase tickets, call the Barnstormers at (515) 633-2255 or visit http://barnstormers.isportstix.com/order/group/first.